A late nymphal stage of the brown marmorated stink bug. Pest description and crop damage Adult stink bugs are all shield-shaped, with a triangle-shaped section in the middle of their backs. They are generally up to about 0.5 to 0.6 inch long. The name stink bug refers to the strong odor the insects can emit if alarmed. The consperse and green stink bugs are native pests, and the brown marmorated stink bug is an invasive pest that is an increasing problem in apples in some regions of the PNW. 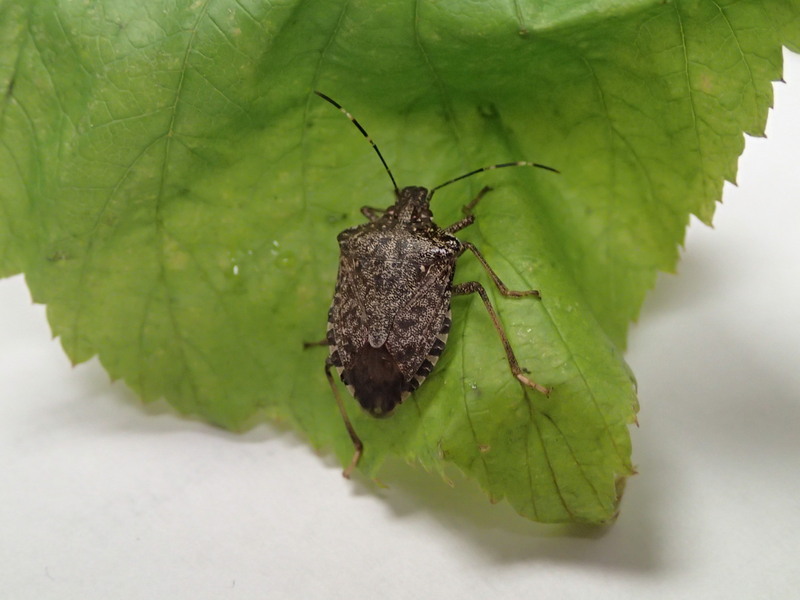 EMERGING PEST: Brown Marmorated Stink Bug: A Threat to Pacific Northwest Agriculture. The adult consperse stink bug is pale brown, yellow underneath with red antennae. The adult green stink bug is bright green. Nymphs are similar in shape to the adults and come in a variety of colors. Brown marmorated stink bug (BMSB) is characterized by white bands on the coal-colored antennae and legs; a distinct brown "marbled" color on the back that consists of flecks of different brown colors; red eyes; and an underside that may be cream, pink, red, yellow or green. 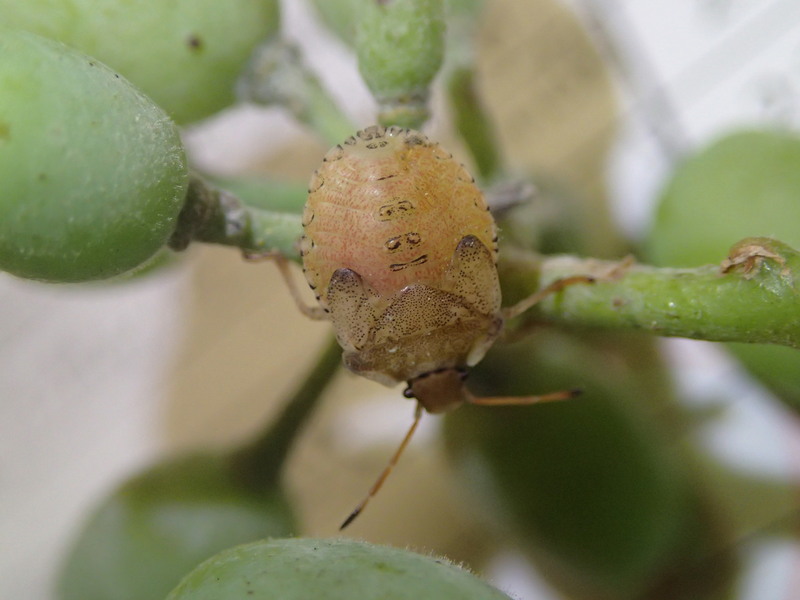 Stink bugs cause damage to plants by sucking sap from buds, leaves, stems or fruits. Cat-facing damage on fruit indicates early season damage. Late season damage may be difficult to detect and worsens in storage. Areas of corky cells will be apparent beneath the skin of the fruit, and these will brown with oxidation. Stink bug damage can superficially resemble the physiological disorder known as bitter pit, but stink bug damage tends to originate within 1 cm of the fruit surface, while bitter pit damage can occur throughout the fruit. Note that chemical controls tend to be very disruptive to orchard natural enemies. 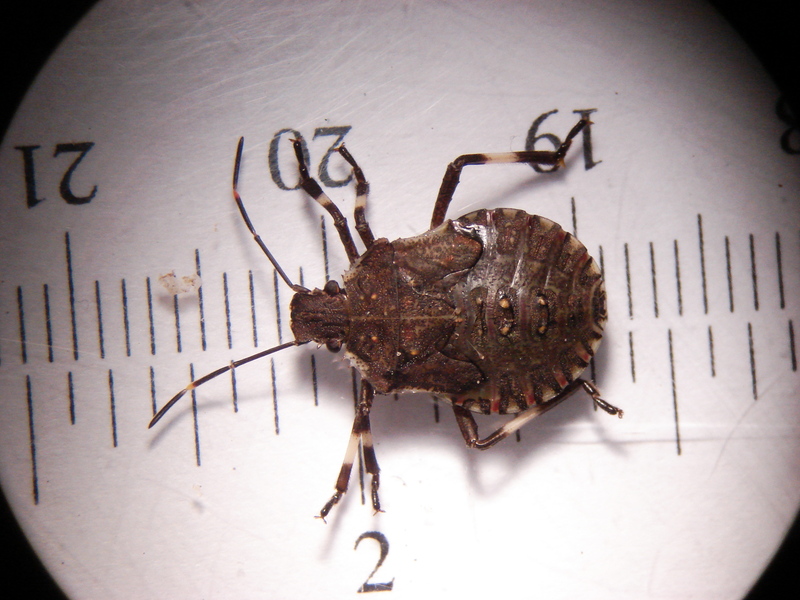 Biology and life history Native stink bug adults overwinter in groundcover. They feed early in the season on weeds and may move later into other host plants. 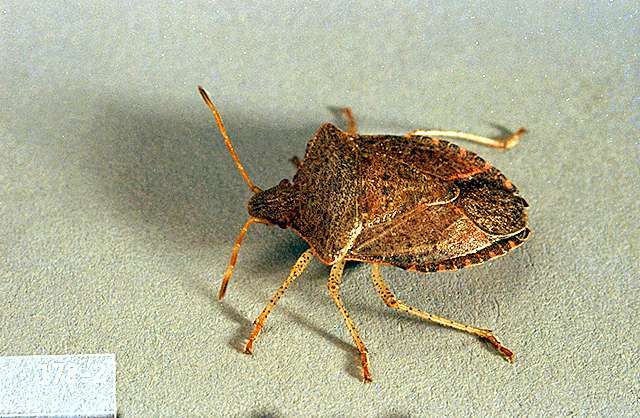 Stink bug damage is worst in dry summers when alternative hosts are dried up. BMSB adults overwinter in human structures including homes, shops and outbuildings. Rock outcrops, leaf litter, and dead standing timber may also be used as overwintering sites for BMSB. BMSB move out from overwintering sites into orchards in the spring where they may begin to reproduce. They may also immigrate in from forest or riparian borders, or other crops throughout the growing season. Egg parasitoids attack native stink bug eggs. Parasitic flies (Tachinidae) attack native stink bug nymphs and adults and lay eggs on them. The egg hatches and the fly larva then penetrates the host stink bug and consumes it from the inside. Native stink bug egg parasitoids and parasitic flies have little effect on BMSB, but an accidentally introduced egg parasitoid called samurai wasp (Trissolcus japonicus) is now establishing across the PNW. Predators of different lifestages include lacewings, ladybird beetles, ground beetles, web-making spiders, praying mantids and others. Manage weedy vegetation within and around the orchard (especially blackberry, mustard and radish). Do not mow cover crops or weeds when stink bugs are present since mowing may cause bugs to disperse to the fruit trees. gamma-cyhalothrin (Declare) at 1.02 to 2.05 fl oz in enough water to achieve good coverage. REI 24 hr. PHI days [Group 3A].